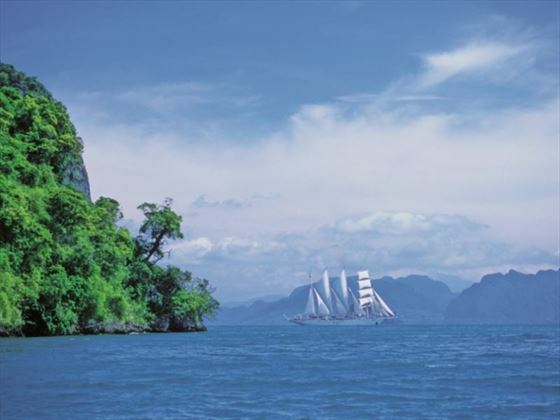 Witness some of Thailand’s most beautiful archipelagos whilst enjoying Star Clipper’s old-style charm on these two fantastic cruise itineraries. Both start with a three night hotel stay in Phuket, before embarking on an eight day cruise; exploring breath-taking diving spots, vibrant towns, and islands full of natural beauty - including hidden gems and areas that can only be seen by boat. 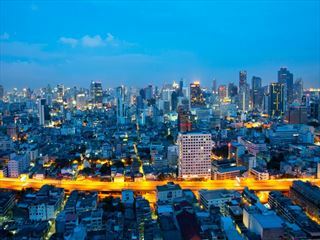 Both trips then end with a one night hotel stay in Patong Bay, Phuket (TM). 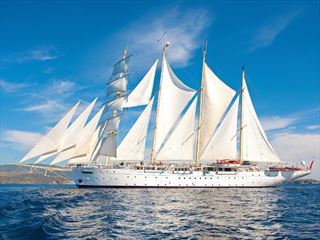 The Star Clipper reflects the nautical heritage of old-time sailing ships, mixing old traditions with modern comforts. 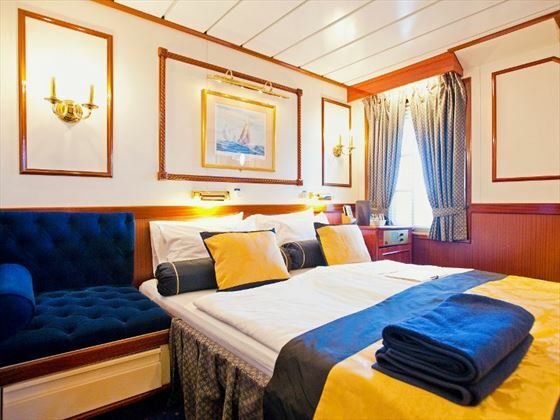 Offering a chilled vibe and a sense of adventure, authentic sailing ship décor is blended with contemporary state rooms featuring an ensuite, DVD players, and sometimes even a private veranda. 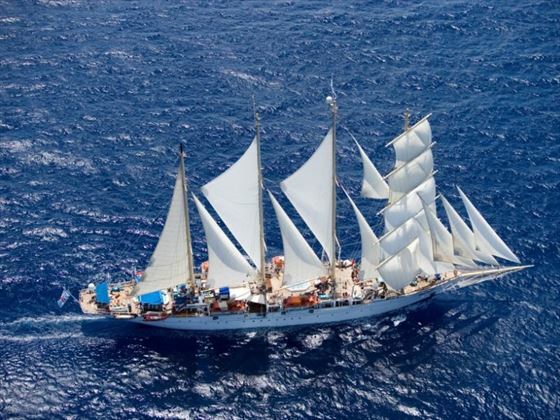 Over the course of seven nights, this charming sailing boat will journey through wonderful areas, including Similan Island, Phang Nga Bay, and Langkawi (SC). For three nights you’ll be staying at a hotel in Phuket, with a great amount of time to explore the naturally beautiful island. Covered in rainforest-clad mountains and surrounded by turquoise waters, this island is home to some of Thailand’s most stunning beaches, so chill out in the sand, or discover the more vibrant main town of Patong. Today you’ll spend the day in Patong Bay to discover its luscious hillsides, verdant coconut groves, and its pristine white beaches. 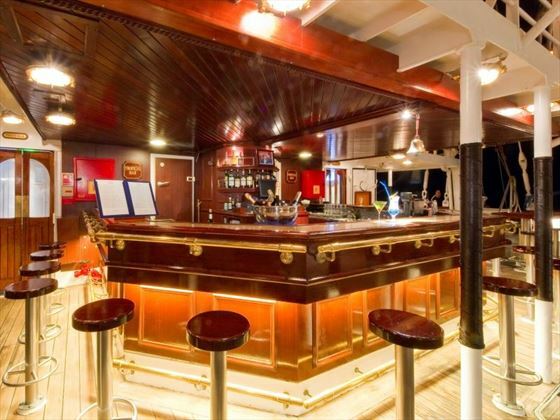 You can even dip in and out of a myriad of vibrant shops, restaurants and bars, before boarding the Star Clipper. Built up of two relatively small islands, this gorgeous area is part of a National Marine Park, gracing travellers with unspoilt natural beauty both on land and under water. There’s an abundance of marine and land wildlife to spot, ducking between the lush flora and emerald waters. Otherwise known as Nine Islands, this is a very popular spot with diving enthusiasts thanks to its dream-like landscapes and the crystal clear Andaman Sea. Begin the day with an early morning visit to Hin Daeng, one of Thailand’s most dramatic dive sites. These small rocks jutting from the topaz waters plunge down over 50 metres underwater, home to plenty of tropical fish and marine life. Afterwards you’ll journey to Ko Rok Nok, one of 15 islands that make up the picturesque Lanta group, located just off the east coast of Thailand and part of a National Marine Park. The view today will be jaw-dropping, journeying to one of 104 islands scattered close by to the northern-most tip of Malaysia. The swimming and diving here is incredible, and you’ll also discover cascading waterfalls, sweeping paddies, and Kuah Town - Langkawi’s capital that blends numerous cultures and offers duty-free shopping. Spectacular views wait for you at Koh Kradan, a small, thin island nestled off the Trang province’s coast. The island is full of luscious green hills and fantastic waters for snorkelling, as well as a quiet, peaceful ambience. 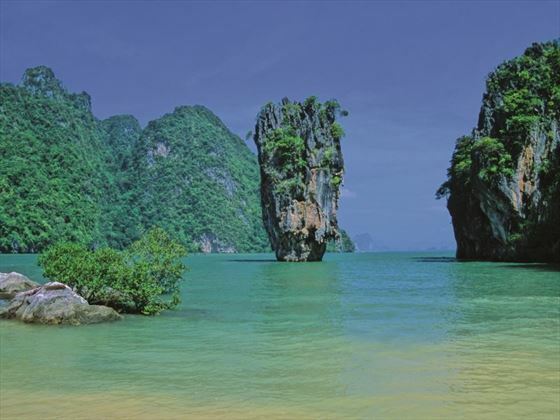 To start the day you’ll be visiting Phang Nga Bay, home to pretty coral reefs, wonderful beaches, and sheer limestone karsts jutting out of its clear blue waters. You’ll then journey to Ko Hong, a picturesque archipelago with a large internal lagoon. Well known as one of the prettiest bays in the area, this island is home to monolithic rocks and powdery white sand beaches. 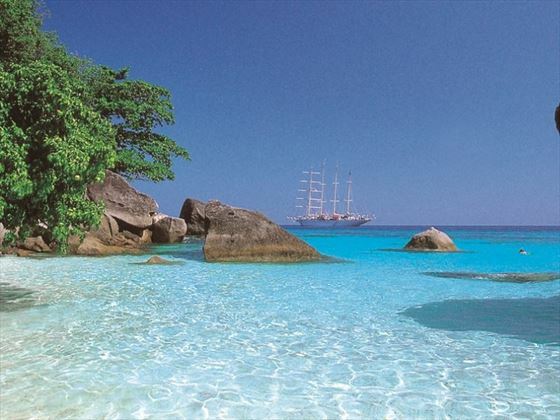 Today you will return to Patong Bay and disembark the Star Clipper to explore and book in to your hotel. Today your trip ends. Either travel to the airport, or call us to organise your next port of call. For the first three nights of your trip you will be staying in a hotel in Phuket, with ample time to explore the island and its natural beauty. Phuket is home to some of Thailand’s most incredible white-sand beaches, and you won’t want to miss the lively town of Patong. Today you will explore the lush hills, powdery white beaches and soaring coconut groves in Patong Bay, wandering through the vibrant shops, bars and restaurants before boarding the Star Clipper for your cruise. Nestled close to the Malaysian island of Langkawi, this island is characterised by its gigantic rock formations and breath-taking beaches, as well as its myriad of marine life and fantastic snorkelling and diving excursions. Known as ‘The Pearl of the Orient’, Penang lies off the north-western coast of Malaysia, connected to the mainland by one of the longest bridges in the world. Throughout the day you’ll explore the capital – Georgetown – a lively hub of foreign influences and a towering 65 storey skyscraper called the Komtar. The capital is also full of great shops, restaurants and theatres, as well as the spectacular Buddhist Kek Lok Si Temple. Travelling almost as far south as you can go on the western coast of Thailand, this marvellous 61 island archipelago is protected by Ko Tarutao National Park and only a short distance from the Malaysian border. This area is beautifully quiet and tranquil – it’s not well known to tourists, and the only habitants are those in the Park offices. 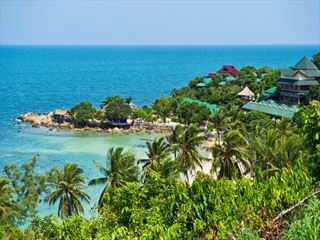 This wonderful island is one of 15 that make up the Lanta group, sitting just of the east coast of Thailand. Part of a National Marine Park, the waters here are crystal clear and emerald green, home to an abundance of marine life. You’ll start your day exploring Phang Nga Bay, well known for the sheer limestone mountains that jut out from the waters. This area is a great place to get at one with nature, with soft sandy beaches and fantastic coral reefs. Later on, you’ll visit Ko Hong – an archipelago home to a large internal lagoon, and well known as one of the prettiest bays in Thailand. You’ll begin your day at Similan Islands, journeying to one of the most renowned spots for diving, with beautiful waters and plenty of exotic marine life to spot. 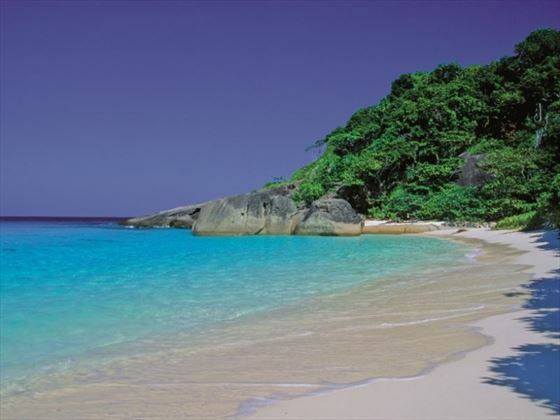 You might also get the chance to visit Ko Miang, the centre of the Similan Islands – home to the National Park headquarters, a charming souvenir shop, a tasty restaurant, and two fabulous beaches. Today you will disembark from the Star Clipper and book in to a hotel for the night, with the rest of the day free to explore more of Patong Bay. Day 12 marks the end of your trip. Either travel to the airport, or call us to arrange your next port of call. 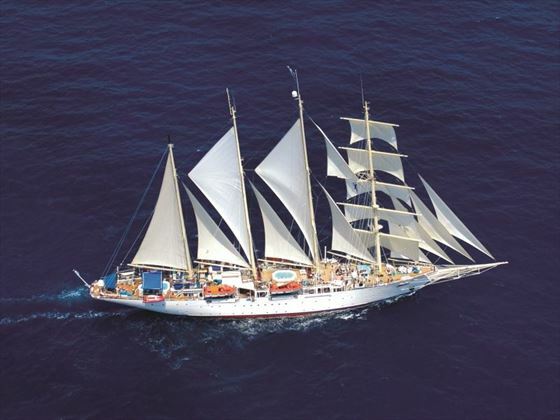 A four-mast sailing ship, Star Clipper is an elegant cruising experience unlike anything else you'll find on the waters. 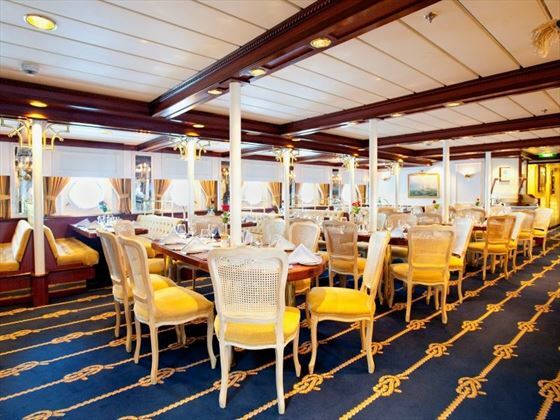 Truly impressive and elegant, you'll enjoy an unforgettable journey with fantastic food and modern amenities. This villa-only stunning and secluded resort is just what you're looking for if you prefer peace and tranquillity to late nights and noisy neighbours. Thanks to an exclusive Chalong Bay setting, you'll be able to discover the true essence of Phuket just moments from your doorstep with some fabulous dining options adding to an extremely attractive and sophisticated ambience. Spa pavilions, wine cellars and guided tours of the surrounding area all help to create a truly memorable experience. 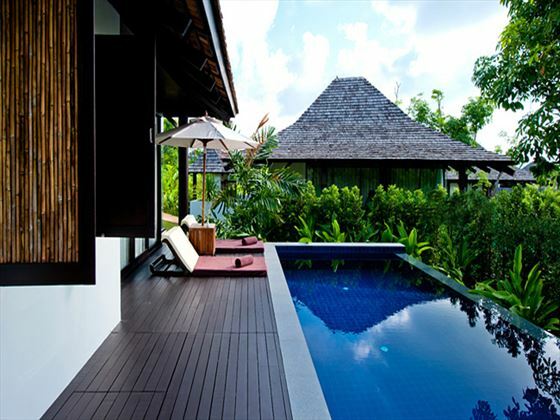 With an array of complimentary activities for all ages to enjoy from Thai boxing classes to botanical walks and meditation in the garden of Baan, you can truly relax and maximise your time here, learning about the customs and rich history of the Balinese and exploring the exotic fauna among the 18 acres of unspoilt natural beauty. The relaxing beach is ideal for serenity and lapping up the sun on the tidal beach in this perfectly tranquil pocket of Thailand. 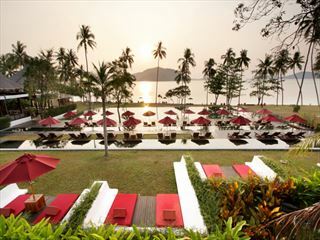 Further reading: The Vijitt Resort is featured in our guide to the top 10 romantic getaways in Thailand. 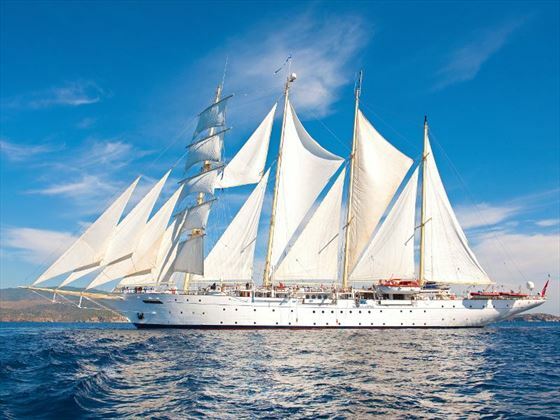 A traditional four-mast sailing ship, Star Clipper cuts elegantly through the water – this is truly one of the most beautiful and impressive cruise ships you will ever see. 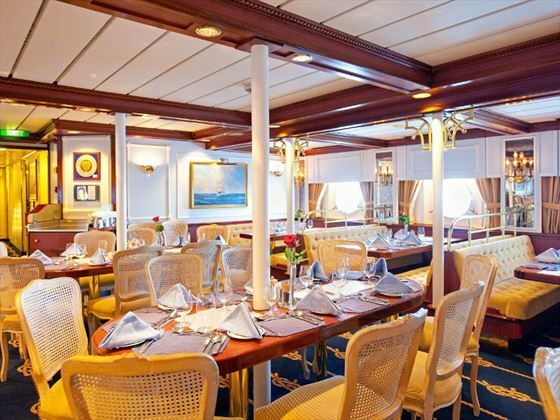 The eye-catching exterior is matched by charming interior styling and comfortable cabins. 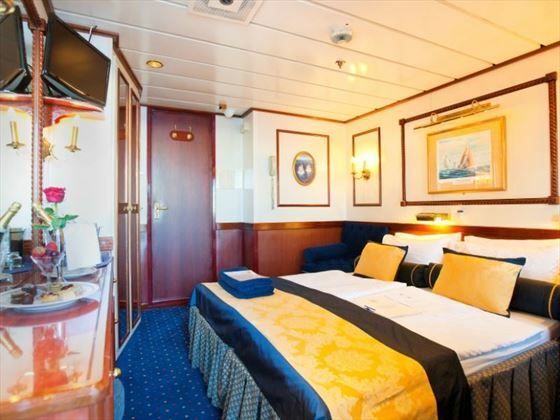 You can choose from a very of cabins ranging from simple rooms with all the amenities you need for a great cruise, to large outside cabins offering views out onto the deck. 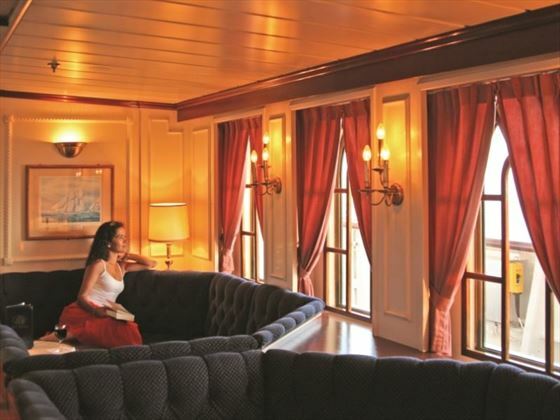 There are two pools, a library and a grand dining room as well as plenty of space to relax and enjoy yourself during your cruise.